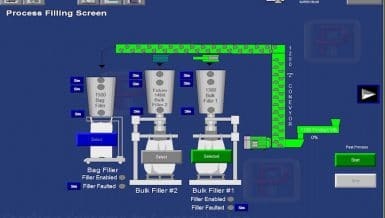 DARLINGTON - Discharge glass frit blends from two bulk bag unloaders into two ball mills. 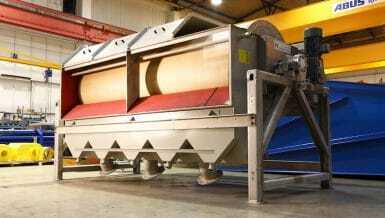 Previously, the client discharged glass frit blends directly from the bulk bag unloaders into the ball mills. As free-falling materials entered the ball mills, impact forces created a lot of uncontrolled dusts. 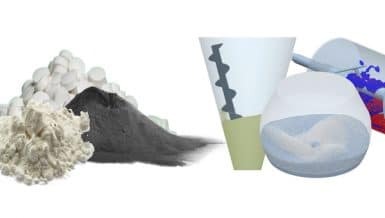 In accordance with new OSHA standards for employee health and safety as it relates to crystalline silica exposure, the client sought equipment specifically designed to contain materials and dusts within the process line, for enhanced dust control. 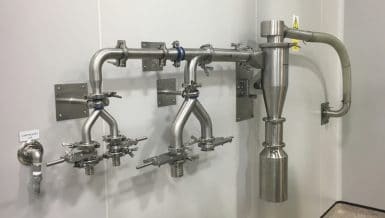 The client sourced two Vortex Loading Spouts to interface the discharge of each bulk bag unloader with the loading port of each ball mill. Above, 1,800 lb | 00 kg bulk bags of glass frit blend are placed in the bulk bag unloaders. Then, the spouts are extended into the loading port of each ball mill before glass frit blends are discharged. Once the ball mills are filled, the spouts are retracted and each ball mill’s loading port is closed. The ball mills are used to grind the glass frit before mixing it with water to create a paste-like substance. The mixture is applied to the interior of water heaters before they are dried and furnace-fired, to create a corrosion-resistant lining. 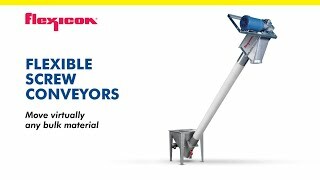 Designed for enclosed loading application. Stacking cones constructed from 235 BHN abrasion-resistant steel. Outlet scavenger constructed from mild steel. Outer sleeve constructed from vinyl (PVC)-coated polyester.